Before you hire a PI | J. Belich & Associates, Inc. Private investigators are usually regulated and licensed by the state in which they practice. 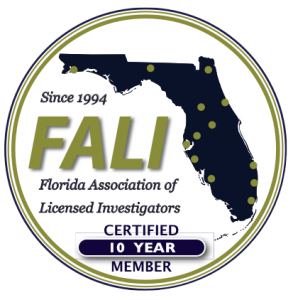 In Florida, the Department of Agriculture and Consumer Services regulates private investigators and private investigative agencies. Always ask to see the PI’s individual state license as well as the agency license. Always ask to see the PI agency occupational license. Always ask to see any professional certifications claimed by the private investigator. Check with the state regulatory agency to see if there have been any complaints filed or if the state has taken any disciplinary action against the private investigator or agency. In Florida, these records are available to the public under the Florida Sunshine Law. Check with your local Better Business Bureau and the Consumer Protection office of your local State Attorney’s Office to see if there have been any complaints filed against the private investigator or the agency. Read and understand the proposed professional service agreement or contract. If you have any uncertainties, ask for clarification and/or take it to your attorney for his/her opinion. Make sure you understand the financial arrangements (fee schedule, retainer, refund policy, etc. Make certain you understand exactly what deliverables (such as case reports, video, still photos, documents, etc.) you are entitled to and when you will get them.